F1 seems to be a bit of a theme amongst our team – we have two riders working in F1 and Simon Smart spent 13 years working in the industry. Richard Harrison is under the spotlight this week. 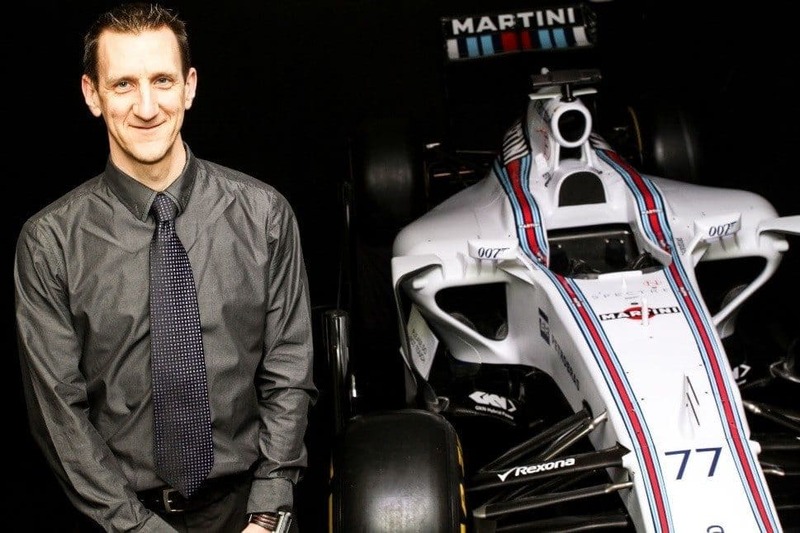 I am an aerodynamicist at the Williams Formula1 team. Two questions that people always ask me are ‘Do you get to go to all the races?’ and ‘Do you get to drive the cars?’ Unfortunately, the answer to both is ‘No’ but I do get to design parts that make it onto the F1 race car, so that’s pretty cool. I start by scheming ideas in CAD and then run them through our CFD simulation software. This gives an idea of the flow features involved with each design, and is used to make further changes to the design. Once designs have reached a suitable stage, I will prepare a test for the windtunnel. I have to work closely with the model design department, who turn our virtual ideas into physical parts to be fitted onto our highly modular 60% scale windtunnel model. These parts are then tested in our on-site windtunnel facility, where we run the model through a range of track conditions. Data is gathered in a number of different ways (eg. load cells, pressure tappings, PIV) to help us understand how each part is working. Analysis of the WT and CFD data is used to make further modifications to part designs and the process is then repeated. Parts that have indicated being positive for race car performance will be released to the Design Office, who manufacture pieces that are added to the full-size race car for an upcoming event. I live close to the WF1 factory so am able to cycle to work most days (weather permitting! ), but the journey is too short to count as training! However, it is useful for waking me up in the morning, or acting as a loosener in the evening before a turbo session. The job can be very demanding and involve long hours. Where possible I try to use my lunch break for cycle training. This time is useful for shorter sessions, such as intervals or recovery rides, and also helps to break up the work day. Longer sessions and endurance rides have to done in the evenings (bring on the turbo!) and weekends. Doing shift work in the windtunnel can also disrupt my routine, as this includes early starts, late finishes and weekend working. All of this means that I have to be very conscientious with my planning and use my time wisely. 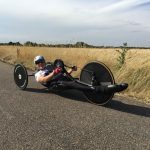 In 2016 my role as an aerodynamicist and my passion for cycling gave me the opportunity to be involved in a unique project. 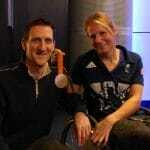 Williams were approached to design a handbike for Karen Darke, who was to compete at the Rio Paralympics. I was part of a small group that did all of the aero design for the bike and in just a few months the whole team designed and built a complete new bike. I was also involved with testing the new machine in the lab and out in the field, as well as some PR work which involved interviews with Channel4 and the BBC. In Rio Karen powered to a gold medal in the timetrial event, which was the perfect result to an amazing project. Karen is such an inspirational and nice person that it was a privilege to work with her and her team, and it was great to be involved in something so special. There are many competitive people at Williams, including a lot of sporty people. It is thanks for some of them that I developed my passion for cycling and have been able to experience many great events. Not long after starting at Williams, we were invited to enter a team time trial event hosted by BMW (our then engine supplier) in Germany. At that stage I was a casual cycling, but I signed up for the training rides, initially struggling to keep up with the group. But I gradually improved and was eventually selected as our B-team captain. The event was tough but a great experience, competing against some very professional-looking teams! My team finished the 44mile event in a respectable 32nd place out of 46. Following this event I continued with my cycling and was part of a work group cycling trip to the Alps. We based ourselves in Bourg d’Oisans and tackled a number of the iconic climbs in the area, including Alp d’huez, the Glandon and the Galibier. I thoroughly enjoyed the challenge and realised I was quite good at climbing! We ended the trip with watching the Tour de France ride up Alp d’huez, which was amazing. After this trip a colleague introduced me to the local time trialling scene, which I took to instantly and I have been competing in TTs ever since. Initially I competed on my road bike, and was soon beating many riders with all the gear. 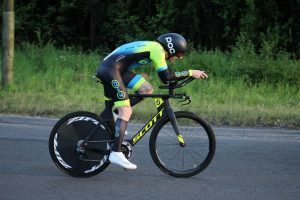 I upgraded to a TT bike and really got into the technical side of the sport, which eventually led me to the D2Z windtunnel. My quest for more speed is ongoing!! Williams also entered a team time trial event at Silverstone a couple of years ago, riding in honour of a lost cycling colleague. We also had another trip to France, this time taking part in the Etape du Tour on the Megeve to Morzine stage, with a brutal final climb up the Joux Plane!